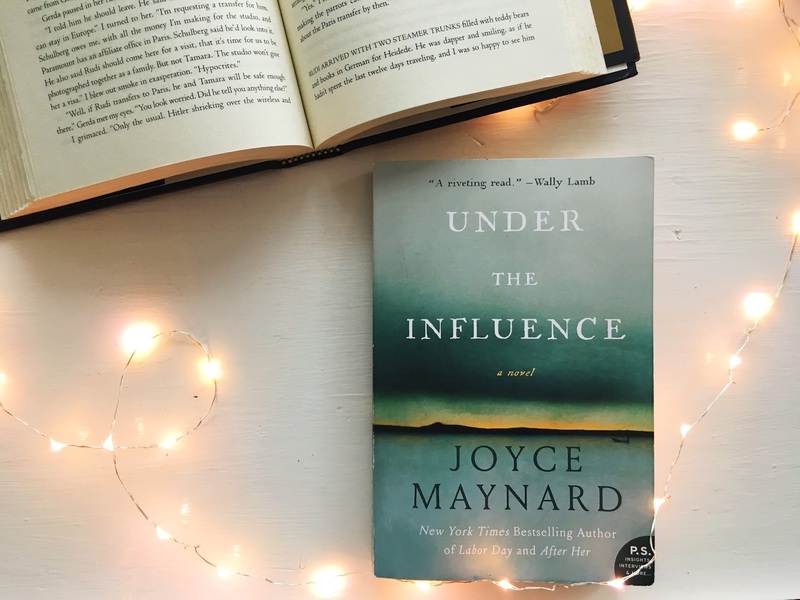 Under the Influence is the newest release by Joyce Maynard. Helen is at her absolute lowest. Her marriage has failed and her drinking has cost her custody of her only son, Ollie, whom she now only sees briefly on weekends. While at an art gallery, Helen meets Ava and Swift Havilland and is immediately pulled into their lives. She takes on small jobs for them, and they take her under their wing by inviting her to lavish parties, providing her with an extraordinary home to use when her son is visiting, and promising to help her regain custody of Ollie. However, things that seem too good to be true generally are and when it comes time to pay up for all of the Havilland's generosity, Helen may not be able to comply with their demands. When Wally Lamb calls a book "riveting" that sets some high expectations, and this book did not disappoint. Under the Influence was completely captivating. I was pulled in right from the very first page. It is a story about friendship, family, envy, and escape. Under the Influence was a book that I mentally carried around with me, even when I was not reading it. Helen is so desperate for attention and love that it's hard not to understand why she was so pulled to the Havillands. They have everything, and they are more than happy to share it with her, as long as she continues to do their bidding. This story kept me engaged because the reader knows that somewhere along the line, Helen is going to be asked to pay up in a major way for all of the opportunities that she has been given by Ava and Swift, but what will be the cost? I enjoyed the writing style and the storyline very much. There were twists and turns along the way that kept me thinking. I felt there was just enough suspense to keep me interested without the terrified feeling that comes along with psychological thrillers. Under the Influence is available for purchase from Amazon or HarperCollins. You can also connect with the author, Joyce Maynard, on her website or on Facebook. Part of the reason I love participating in promotional book tours is that I often get to learn about authors that are new to me, and that I possibly would have not otherwise known. This was my first Joyce Maynard novel, and it will not be my last. I look forward to reading more from this author in the future. Disclaimer - I was sent a complementary copy of Under the Influence from HarperCollins and TLC Book Tours. All thoughts and opinions are entirely my own. To see what other bloggers had to say about this book, you can check out the full book tour.